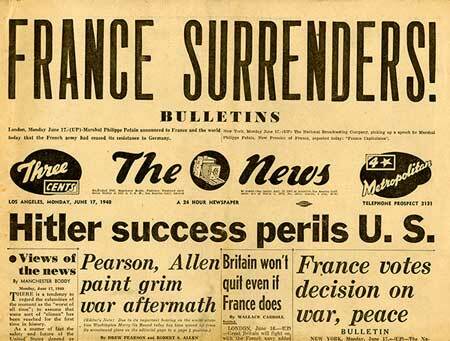 The United States was economically hobbled at the dawn of the Second World War. 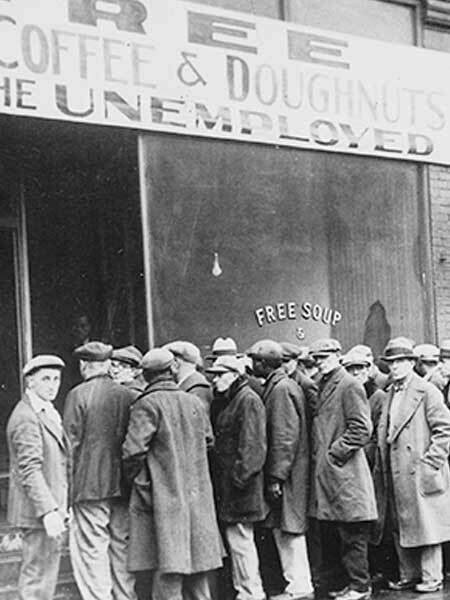 Many were still devastated by the effects of the Great Depression, and unemployment was at 17.2% in 1939. It would take some convincing to get this tired nation to rally to war. Militarily, the US had the 17th largest army in the world—right behind Romania. If we were to go to war, it would require an upending of the nation as we knew it. When Germany invaded Poland on September 1, 1939, the United States had fewer than 200,000 troops at its disposal. Meanwhile, the German Wehrmacht had 4.7 million troops in service when the war began. Three days after Hitler launched his assault, President Roosevelt met with his advisors. 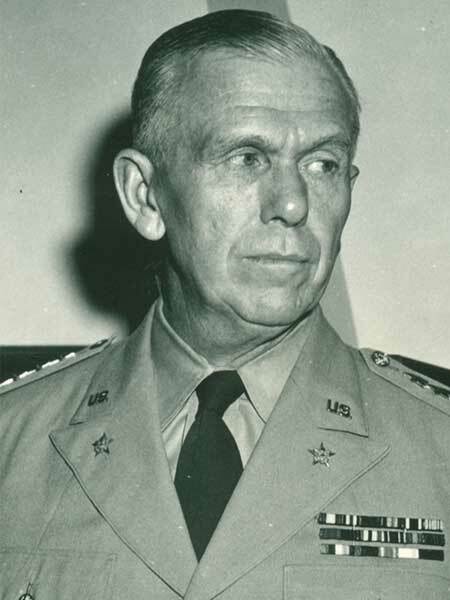 The Army’s Chief of Staff, General George Marshall, urged the President to immediately begin preparing for war. 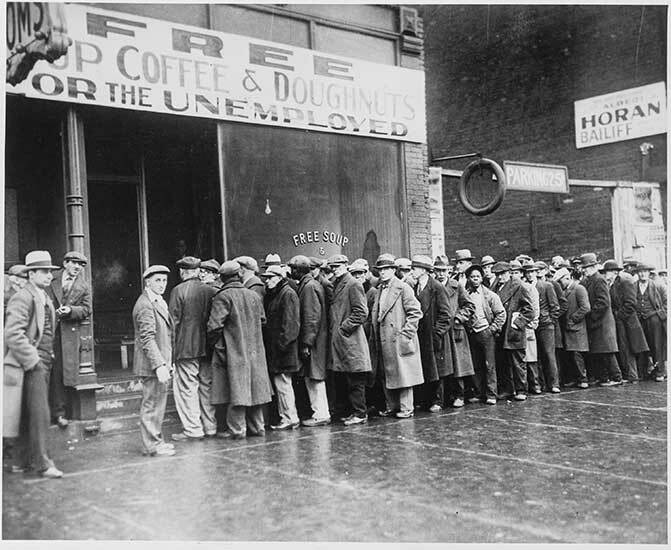 Unemployed men wait in line outside of a soup kitchen in Chicago. Such scenes became common during the Depression. Courtesy of National Archives. The Fall of France spurred President Roosevelt into action with regard to mobilization. 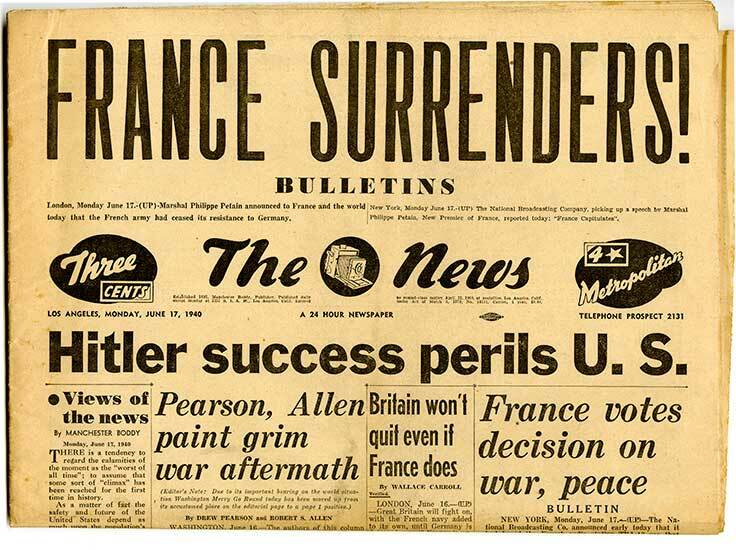 He knew that it was only a matter of time before the United States would be embroiled in WWII. The National WWII Museum, 2014.447.01. 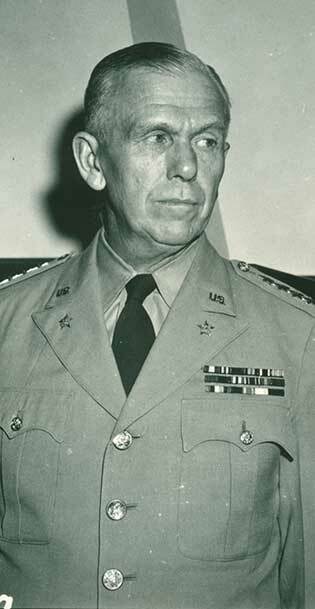 On May 13, 1940, General George Marshall (often considered the architect of the American war effort) warned Roosevelt, "If five German divisions landed anywhere on the coast, they could go anywhere they wished." Gift of Regan Forrester, 2002.337.631. This clip from Prelude to War, part of Frank Capra’s Why We Fight series, shows with unrelenting repetition the readiness of Axis forces—providing cause for alarm and motivation for mobilization, since the US military was woefully unprepared when war broke out in Europe. 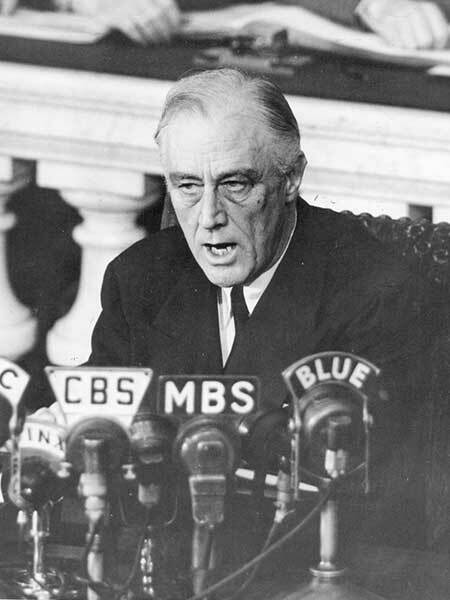 The first president to give an televised address, Franklin Roosevelt possessed excellent oratorical skills. He popularized the "Arsenal of Democracy" label for American industry. Courtesy of National Archives. On May 16, 1940, the President proclaimed to Congress: "I should like to see this nation geared up to the ability to turn out at least 50,000 planes a year." While isolationists scoffed, Roosevelt actively sought an industrial leader who could head the monumental mobilization effort needed. He turned to Bernard Baruch, who performed the task during WWI. Baruch praised and recommended forward-thinking auto producer William Knudsen. Roosevelt phoned Knudsen, then CEO of General Motors, a couple of weeks after his plea to Congress. Knudsen swiftly resigned his post, forfeited his six-figure salary, and joined FDR's National Defense Advisory Council—becoming the first of approximately 300 industrial corporate executives (frequently referred to as "The Dollar-a-Year Men") to agree to be paid a dollar a year by the federal government. William Knudsen gained his reputation by revolutionizing mass production in the auto industry, first managing assembly lines in Ford plants across the nation. Courtesy of National Archives. 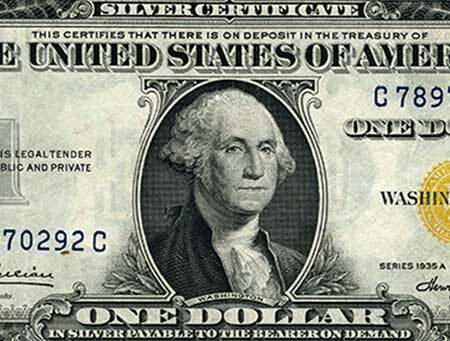 Many industrial leaders donated their services to the war effort receiving the token pay of one dollar a year. 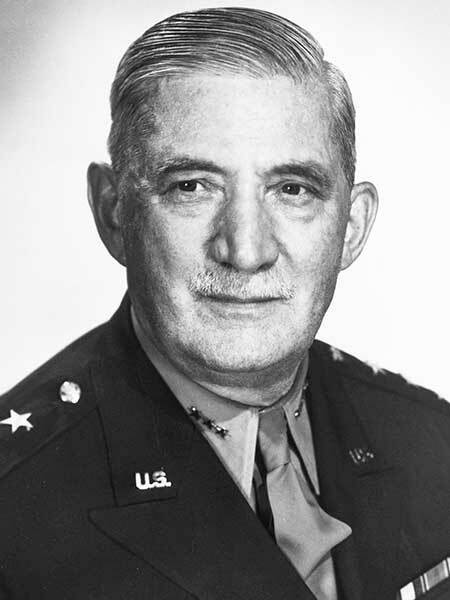 By October 1940, Knudsen had overseen the awarding of 920 military contracts valued at more than $9 billion. Approximately 500 companies agreed to make everything from ships to tanks to gunpowder to ammonia; development of 784 new factories was soon under way. On the evening of December 29, 1940, FDR gave this radio address, urging Americans to come to the aid of Britain and democratic principles. 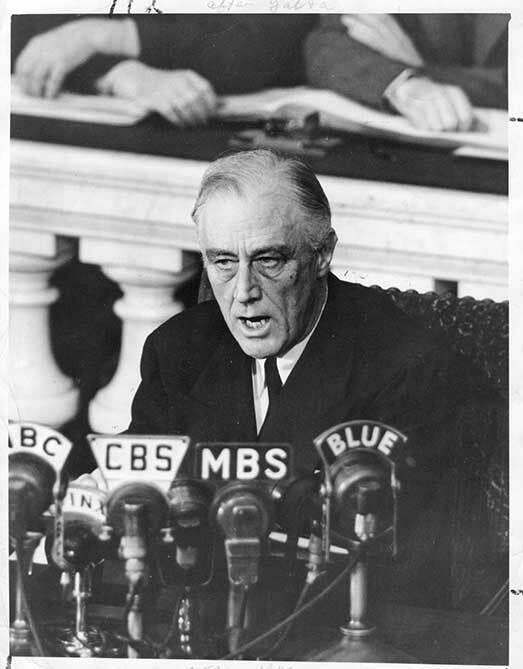 While polls showed that most Americans wanted to stay out of the war, the President delivered what became known as his "Arsenal of Democracy" speech on December 29, 1940, passionately claiming that every man, woman, and child had a contribution to make in defense of the democratic ideal. 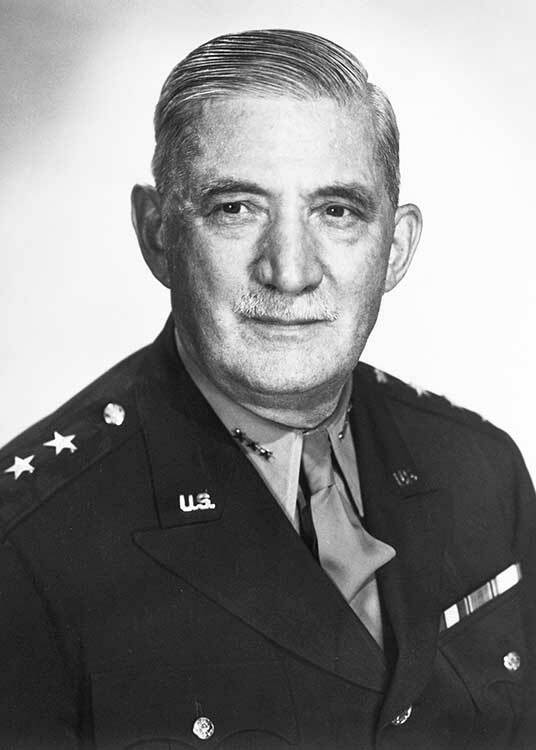 His appeal was successful, and Congress passed the Lend-Lease Act three months later. Under it, American war materials streamed into Britain. The "Arsenal of Democracy" had begun. The Museum has developed lesson plans for teachers, a webinar for distance learning, and other resources to help you learn and teach more about The Arsenal of Democracy. All exhibits have been specially designed for easy installation in museums, libraries, community centers, and other traditional and non-traditional environments. The Museum Store sells commemorative items that help fund the continuing educational mission of The National WWII Museum in New Orleans.